Another Summerfest concert announcement! At this rate, I almost can't keep up with all of these additions to the Summerfest Marcus Amphitheater lineup. Iron Maiden will headline Summerfest at the Marcus Amphitheater on July 4th with special guest Alice Cooper. Ticket King Milwaukee is your source of Iron Maiden Summerfest tickets. 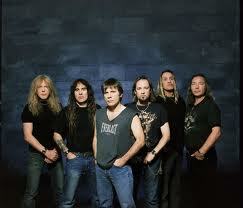 Iron Maiden makes their visit to Summerfest as a part of their Maiden England World Tour. The unique aspect of this tour is that it will be based on Iron Maiden's 1988 7th Tour of a 7th Tour which resulted in a concert video also called Maiden England World Tour. This unique tour will give heavy metal fans the opportunity to enjoy some of Iron Maiden's classic hits as the British band gained its fame in the 1980s. And what about rock n' roll hall of famer Alice Cooper? The famous rocker hardly needs an introduction. He will be an excellent addition to this show (as long as there are no chickens on stage). I can't think of a better way to celebrate the fourth of July than to head to the Marcus Amphitheater for a night of heavy metal from some incredible rockers!